European politicians failed to see that the single currency’s existence is in peril, trying to blame the system’s failures on individual countries, Aditya Chakrabortty, lead economics writer for The Guardian newspaper, told RT. ­The result is that, at least for Greece, every feasible way of dealing with the crisis would involve the army maintaining martial law and order on the streets. RT: We’ve recently seen elections in Greece, which have shown that the Greek people reject austerity. How long do you think this rebellion is going to go on for? Aditya Chakrabortty: I think it has already been going on for the best part of two years, ever since the European Union and the IMF imposed the really severe program of spending cuts and reform of welfare on Greece. We’ve basically seen a country which has very quickly descended into the realms of ungovernable. What we saw simply in the last elections was about getting 70 per cent of electors voted against austerity – that is, for a party that was against austerity. Now whether it means that they are against all spending cuts, whether it means they are against reforming labor laws, whether it means they are against changing the welfare system or whether they are against privatizing whole swathes of the national assets I don’t know. But what you do see very clearly from Greece at these elections – and I think that we’ve seen it for the best part of two years – is a kind of wholesale rejection of the program that is being imposed upon Greece. RT: We have seen Germany’s finance minister make it very clear that either Greece sticks to this austerity or it quits the eurozone. What is in Greece’s interest, would you say? AC: What’s best for them, I think is obvious – it’s to stop this austerity. What happens next – that’s a more vexed question. If you want to talk about whether it’s a good idea for Greece to stay in the euro or not, I think either way it’s going to be a very painful decision for Greece. If it stays within the euro, it will be forced to stick to some kind of program imposed on it from outside for a long time to come. And it won’t have that great safety fail that is normally given to countries in distress – it won’t be able to devalue its own currency. That’s the problem with staying in the euro. The problems of leaving, on the other hand, are the kind of volatility and turbulence, which may well make the general strikes and all the rest of it like a walk in the park compared to what happens next. RT: That’s Greece’s point of view, but what about the point of view of the rest of the eurozone? German Chancellor Angela Merkel and new French President Francois Hollande both say that they want Greece to stay in the eurozone. Is Greece essential for keeping the eurozone together? AC: It’s not. But the big question, which will come up as soon as any country walks out the door, is which are going to follow after it? Greece is a very small economy. Greece is also pretty clearly an exceptional case within the eurozone economy because it had the biggest crisis of the lot. It had the biggest past of the lot. It’s got a sclerotic political class. It has got a whole lot of problems that are specific to Greece. But if it goes, then what will stop Portugal from going? This has been the big question ever since southern Europe got into trouble. It was never about one country in particular. And it was particularly not about Greece. As soon as this question rises about Greece, then actually the bigger question will get raised: what about Spain; what about Italy? These are the really big economies within southern Europe and within the eurozone. RT: Angela Merkel said “if the euro collapses, Europe itself ill collapse.” Do you think that this prophecy is coming true? AC: It’s a very funny statement for the German chancellor to make, because the euro is a union of 17 countries, while the European Union is a union of 27 countries and is growing. So for her to allow one with another is a very curious thing to do. It may a bit over-stretched, but it may also be that she sees the eurozone effectively without what happens with the rest of the European Union. The problem she has got is that she says the euro equals the European Union, but she also says austerity equals the euro. So what you’ve got very clearly – and not just in Greece, but across the eurozone now – you’ve got electorates and governments collapsing because they cannot impose austerity on their voters. So even in the Netherlands the government collapses because it cannot impose the austerity. Belgium hadn’t had a government for the best part of a year. RT: What about potential exit for Greece? Politicians are now really for the first time talking about an actual situation where Greece might exit. They are talking about “orderly” or “disorderly” exit. What do these terms really mean and what real difference they could make? AC: The really odd thing about this orderly or disorderly is “orderly or disorderly for whom”? I can assure you that under any situation, however well-managed, for the ordinary Greeks it’s going to be very disorderly indeed; very, very turbulent. People have been modeling what a Greek exit from the eurozone would look like politically and economically for the best part of a year. Politically even those who are in favor of Greece leaving the eurozone accept that it would involve the army being on the streets to keep order. It would mean that banks would be forcibly shut, that the ATMs would not be working. It would mean that people would be stopped from leaving the country, especially with folds of euros in their back pockets, because the country would then need to stop all capital from leaving the country and to maintain a very high level of law and order. It would feel effectively like a country in the middle of a martial revolt. The question mark for orderly and disorderly is really for the rest of the eurozone. If the eurozone can say to financial markets “look, Greece is leaving, but we all know that Greece is a special case, and actually its problems are not for the rest of the eurozone” – that’s what they really mean by an “orderly exit”. That’s if they can convince everyone that Greece is leaving because of Greece, not because of the euro. 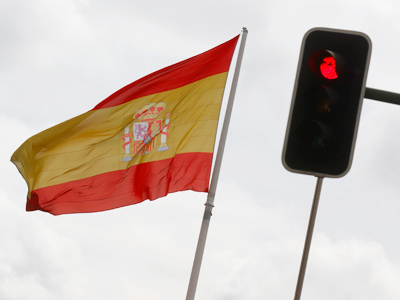 I don’t think financial markets would buy that, because the rot has gone so far that financial markets are not willing to lend to Spain or to Italy. I don’t think people any longer see it as a problem confined to just one or two small countries. 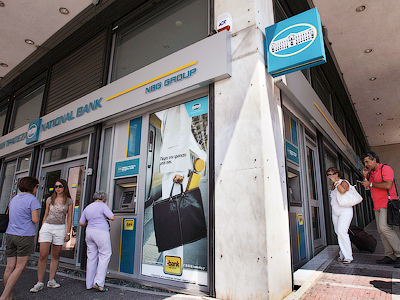 RT: What about the situation with the banking sector in Greece at the moment? 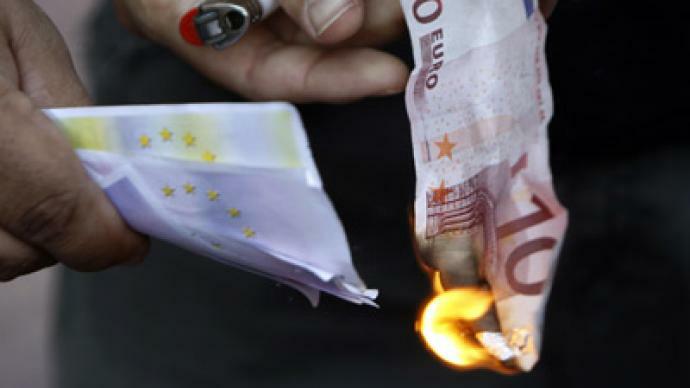 We’ve seen about a billion euros withdrawn from Greek banks over the last 10 days. How close do you think it is to panic withdrawing? AC: I went into one of the biggest banks in Greece in the capital Athens in Syntagma Square last summer. I asked one of the cashiers: “What’s your most popular financial product?” And he poured out: “A safe box.” He said what people are doing now is renting safes in which to put money. They no longer keep their money in the accounts in a bank. They keep it in a safe box in the vault below. It’s like 21st century keeping it under the pillow. 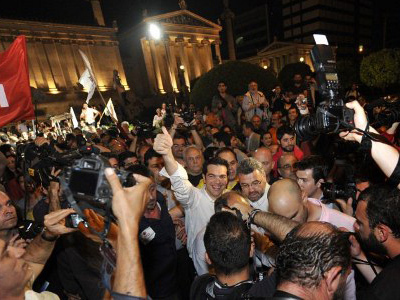 So actually a bank run, a very slow-motion bank run, has been evident in Greece for the best part o f a year. What you’ve seen in the past 10 days is it’s sped up dramatically. The banking system in Greece to all intents and purposes has been a zombified banking system for the best part of the year, because most of the debts that Greece holds have been written down so much. And a significant portion of those debts held by the Greek government, are held by the Greek banking system. So effectively they are sitting on a pile of worthless loans. And that’s before you get on to the loans, that were made by businesses and households, which also not worth half of what they were – if that. So it’s pretty clear that whatever you will have to do with Greece – whether it stays in euro or doesn’t stay in euro, whether it continues austerity or doesn’t continue austerity – it needs to do something to restructure and bring back to life its banking system. But it doesn’t have the money to do that. And no one in the rest of Europe is willing to give it the money to do that. RT: All over Europe there is a growing popular opposition to the political and economic union. How have the European bureaucrats failed to convince the people that the European Union as a whole and the euro particularly are a good idea? AC: I’d turn that question on. You’d have to say it’s the crowning achievement of Brussels that it has managed to take a largely pro-European continent and turn it so wholesale against Europe and the euro. We are talking in Britain, where if you look at the popular press and even sections of our political party system, there are whole varieties of people who see Brussels is being on some kind of a conspiracy plot to turn all bananas straight. And it has always been part of the British public discourse. What’s been really interesting for across the channel is that more and more of the continent has been turning against the euro and Europe. I think it goes largely back to what Angela Merkel says about “if the euro fails, than Europe fails.” She has made Europe about the euro and she has made euro about making vicious spending cuts. Even in Germany – which is seen as being the strongest and most successful economy in the past decade – even in Germany the average German worker has seen his or her wage fall over the last decade. If you take out inflation, the median German wage has fallen 4 per cent over the past decade. So even your average German worker, a person in the strongest economy in all of Europe is worse off now since the euro launched. RT: And how do you think politicians in Brussels are willing to go to save the union and the euro? AC: What we’ve seen over the past two to two-and-a-half years is effectively a whole series of blame games going on. As soon as it became clear that Greece was in trouble, people in Brussels and across Europe said, “That’s Greece; we always knew they shouldn’t really be part of the eurozone in the first place.” Then Ireland says, “We are in trouble too.” – “Well, you know, the Irish, they can never control their property market.” Then Portugal. “Where is Portugal, for heaven’s sake?” Then Spain and Italy… And it always becomes the fault of those individual countries. And until very recently nobody said “Hang on; there is a systemic problem here.” Because whole swathes of Europe are now effectively going bankrupt or are as close to bankrupt as you can officially get. So it is very belatedly that they’ve realized that actually this is not just about countries being afoul, but about an existential crisis for the euro. They have just realized that and are nowhere near putting policies in place that might save the euro.